Although the name "Cullaville", or "Culloville", does not appear on any ancient map of Creggan parish until Rocque's Map appeared in 1760, several of the local townland names appeared on much earlier maps and records. Drumboy, Glasdrummanaghy, Creevekeeran and Lisamry are named on the Escheated Counties Map of the Fews, in 1609. In the Inquisition on 26th March 1640 into the lands owned by Sir Turlagh MacHenry O'Neill of Glasdrumman, these townlands, along with Ballynacarry, Lissaraw, Cappagh, Clonalig, Carrickamone and Monaguillagh are named. In the Down Survey Map of Upper Fews of 1655, these townlands are again named. Consequently, one can confidentially assume that this section of the parish of Creggan has been populated for at least four hundred years. John Donaldson in his "Account of the Barony of Upper Fews", written in 1838, had the following to say about Cullaville: Culloville or Cullaghsville derives its name from the McCullagh family, in whose estate it is The village consists of only a few detached houses, among which is a house belonging to Hugh O'Callaghan, Esq., who now lives somewhere contiguous to Dublin, but keeps this house and farm in his own hands. A patent was obtained (in 1754) by the late James McCullagh, Esq., for holding four fairs in each year in this village - the first of which was to hold for two days, but at their commencement several unhappy party quarrels having taken place in them, they have been discontinued ever since Ville" is the French word for a village and consequently "McCullaghsville" simply means "McCullagh's Village" and in Irish is "Baile Mhic Cholla". The McCullaghs, a Scottish or English family, had obtained a substantial portion of the 30,000 - acre estate of Sir Henry O'Neill of Glassdrumman, when that family was transplanted to Bohola in Co. Mayo, in 1654. They owned land in Co. Monaghan and Co. Armagh and they built a scutch-mill (as well as several other mills) on the River Fane, at the bottom of "Corismood". This mill was later acquired by Patrick McConville, Crossmaglen and, during the 1939-1945 War, was taken over by the Kingham family and then became known as Kingham's Mill. The burning of one of McCullagh's mills was one of the charges levelled at the "Crossmaglen Conspirators", in 1883. Camly McCullagh probably derives its name from one of these McCullaghs. The name clearly on Rocque's Map (1760) is "Culloville", without any reference to McCullagh. Another reference to Cullaville appears in "A View of the Present State of Ireland" written by 'An Observer", in 1797, from which I quote: "In June last (1797), a party of the Ancient Britons, a fencible regiment, commanded by Sir Watkins William Wynne, were ordered to examine the house of Mr. Rice, an inn keeper in the town of Coolavill, county of Armagh, for arms but, on making a very diligent search, none could be found. There were some country people drinking in the house and discoursing in their native language. The soldiers damned their eternal Irish souls, that they were speaking treason, and instantly fell on them with their swords and maimed several desperately. Miss Rice was so badly wounded that her life was despaired of and her father escaped with	much difficulty, after having received many cuts from the sabres of these assassins…." (Things change but some things never change !). Strangely enough, the name of the area did not change to Rice's Cross, similar to Hackballscross, which derives its name from Paddy Hackball, the innkeeper there. Earlier that year, several men from the Cullaville area were arrested on suspicion of being United Irishmen but were later released. It is also interesting that Christopher Crawley, Captain of the Cross and Creggan Yeomen, who created such havoc in the parish in 1798, was a native of Cullaville. It was Crawley who arrested and hanged "brave honest Tom McArdle", the Creevekeeran blacksmith, from a high ash tree in the town of Crossmaglen, on suspicion that he was making pikes for the Rebellion of 1798. 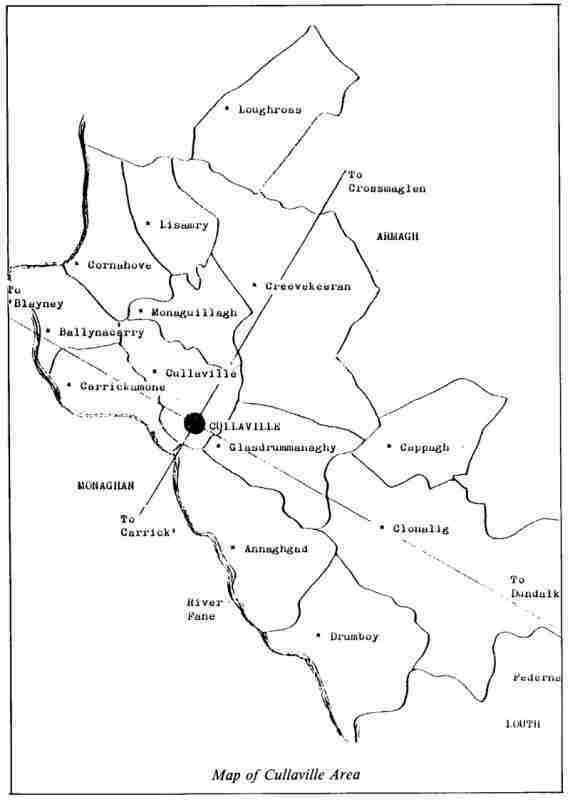 Cullaville as a townland does not appear on any 17th. century map. Fr. Larry Murray, the noted historian and scholar, suggests that it was included in the nearby townland of Monaguillagh and this surmise is supported by the list of the inhabitants of Monaguillagh in 1766, which will be given later. The next written record of the name Cullaville appears in "The Return of Registered Freeholders, 1813-1820". The list includes the names James and Hugh O'Callaghan, Cullaville, and Thomas O'Callaghan, Ivy Lodge, Clonalig. Cullaville as a townland appears on the first Ordnance Survey map in 1834, containing 145 acres 2 roods and 12 square perches. The following note appears: "There is a village of the same name in this townland…. it is a pretty clean village on a good situation at the junction of four principal roads….. The land is tolerably good. There are only two small dwellings detached from the village…." The name O'Callaghan in Cullaville strikes several chords. They were a Catholic landlord family and owned a distillery on the site where Cathal McAleavey's publichouse now stands. They owned or leased substantial property all over the parish and in Co. Monaghan and, consequently, were not very popular in a parish which was generally seething with agrarian agitation and discontent against landlord tyranny. It was on their land in Shelagh and Courtbane that the brothers, Ardle and James Clarke, Tavanamore, were murdered on 19th, April, 1849. The Clarkes were employed as caretakers there on land from which several families had been evicted. The O'Callaghans inspired bitter poems from both Art MacCooey (1738-1773), the famous Creggan poet, and from Art Bennett (1793-1879), the noted Mullaghbane poet. Despite the adverse poetic opinion, it is only fair to say that one of the O'Callaghans complained to Dublin Castle in 1798, regarding the excesses of the Cross and Creggan Yeomen, led by. Crawley, and the excesses of Lord Blayney's "bloodhounds" during the same turbulent period. Another of the O'Callaghans was suspected of being a member of the United Irishmen in 1798 and had to flee the country. He reached France safely and soon became a Colonel in the French army. He took part in the Peninsular War in Spain, in 1803, when both France and Spain were at war with England. By an unusual twist of fate, O'Callaghan's Regiment captured Lord Blayney, whose regiment, the 89th Foot, were making a raid from Gibraltar into Spain. That must have been an interesting confrontation - a Cullaville man confronting a 'Blayney man in far off Spain. Another member of the family, Owen, was a member of the Grand Jury for both Co. Armagh and Co. Monaghan. He died in 1803 and was buried in Creggan, where his wall-enclosed grave and headstone are still to be seen. Another of the clan, James, clashed bitterly with Fr. Michael Lennon, P. P. Upper Creggan (1 829-187 1), during the Westminister Parliamentary Inquiry into the activities of Ribbonmen in South Armagh, in 1852. Gradually, the family moved out of the area. One of them married a Protestant and "turned" and his two daughters inherited whatever property was left. The family name is remembered in the townland name of Tullydonnell O'Callaghan, which was bought-out under the Wyndham Land Act (1903), as recently as 1925. The O'Callaghan story is worthy of more intensive research. The O'Neills of Annaghgad were another interesting family in the Cullaville area. Daniel, Owen and Francis are named in the 1766 parish census and it is from these that the present O'Neills of the parish are descended. Daniel O'Neill became a prosperous linen merchant and Art MacCooey wrote a lament for his son, Art, when he died in July 1769. The title of the lament is "Marbhna Airt 6ig Ui N@ill", in which occurs the line, "Ta an Chros faoi ghruaim gan Cuirt Ui Neill ann", i.e., "Cross is in sorrow without O'Neill's 'Court' there". Both Art and Daniel are buried in Creggan, It was Daniel's brother, Feilimi, or Felix, who added much glory and honour to the O'Neill name and whose career surpassed many of the more famous O'Neills in exile. He was taken to Spain at an early age and joined the Regiment of Tyrone in the Spanish army. Because of his outstanding ability, he soon rose to the rank of Lieutenant Colonel. He travelled to Scotland to help Bonny Prince Charlie Stuart in his attempt to regain the English throne from the Stuarts. The rebellion floundered on the bloody field of Colloden in 1746 and Felix was one of the small band which accompanied the Prince to the Isle of Islay, in the Hebrides. While there, he assisted Flora McDonald to organise the escape of Bonny Prince Charlie to France. He was later arrested by the English and narrowly escaped torture and execution. He later escaped to France and made his way back to Spain, where he rejoined the Regiment of Tyrone. He soon rose to the rank of Lieutenant General and became a member of the Supreme Council of War in Spain. The O'Neill family of Mallorca are descended from one of Colonel Felix's sons. Incidentally, the name O'Neill is pronounced "O'Nale" in Spain. The Cullaville area also played a prominent part in the alleged "Crossmaglen Conspiracy" in the early 1880's. Thirteen men from Creggan parish and the surrounding parishes were charged with treason-felony and conspiracy to murder. They were: John McBride, Maghernakill; Josephy Daly, Kilmurry; Denis Nugent, Urker; Edward O'Hanlon, Cashel; James Hanratty, Loughross; Thomas Kelly, Crossmaglen; Peter Coleman, Laragh; Bernard Smith, Mullaghbane; Peter Devlin, "Railway Gates"; Patrick Geoghegan, Drumgristan; John Donnelly, Carnally; Patrick Finnegan, Lurgancullenboy, who lived in Cullaville; and Michael Watters, Monaguillagh, who taught with his uncle, Patrick Watters, in Clonalig National School. John Donnelly was released but the twelve others were sentenced to terms of imprisonment ranging from five to ten years. To their dying days, each of those convicted maintained complete innocence. Michael Watters died in Kilmainham Jail on 22nd October, 1883. It was he or Denis Nugent, or both, who composed the ballad, "The Dummy Clock of Crossmaglen", erected by the landlord, Thomas Ball, which probably had some influence on their conviction. Many other men from Cullaville were suspected and named during the trial and, for good measure, the informer, Patrick Duffy, had a blacksmith's shop in Cullaville, in 1880. On the eastern boundary of Cullaville, lay the traditionally known area of Federna, which probably included the townlands of Clonalig, Drumboat and Rassan. The name is still remembered in the names Federna Bog, Federna Barracks (Phelim Hearty's), Federna School (Courtbane National School) and Federna Bush, replanted in 1985. This area had a formidable reputation in olden times for highjacking and way-laying unsuspecting travellers. There was an old saying which said "A traveller is safe on the road from Dundalk to Derry, once he gets past the glen of Cross" and John McEnaney, "The Bard of Callenberg" (1872-1943), wrote: "The road is safe for any man who says a prayer at the Casa Cam" (a noted bad turn in Clonalig, now gone, which is mentioned in the Irish ballad, "Casadh Cam na Federnai", "The Crooked Turn of Federna"). This area is convenient to the infamous site of the thieves' fair (Baile an Ghadai), in Drumboy. Part of this road lived up to its unenviable reputation in the 1970's, when many travellers rued the day they travelled from Dulidalk to Castleblayiiey and vice versa. It has been suggested that this unusual word means in English, the place of ambush, or a concealed place. Clonalig:- Cluain a'Loig - the meadow of the hollow or of the pools: 1766 - Hugh MeMaster; James Gwin; Owen McKenna; John McArdle; Hugh Harvassy; John McMahon. Cappagh:- Ceapach - a cluster of houses: appears to have been included in Clonalig in 1766. Drumboy:- Drom Bui - the yellow (whinny) hill or Drom Biodhbhaidh - the robbers' hill or ridge. The site of the traditional thieves' fair, Baile an Ghadai, was situated in this townland. 1766 - Robert Waters; F. Campbell; Patrick Campbell; Ross McKenna; Edward Carragher; Bryan Burn; Patrick Hughs. Charles, Terence, Hugh and John O'Neill are on the 1828 list for this townland. Annaghgad:- Eanach Fhada - the long swamp or the swamp of the withes or osiers. 1766 - Daniel O'Neile; Owen O'Neile; Francis O'Neile; Edward Lappen; - MeGill; Patrick Moony; John Cunningham; Edmund Cunningham; Hugh Makin. The O'Neills do not appear on the 1828 list. Glasdrummanaghy:- Glasdroman an Atha - the green hill of the ford. 1766 - Widow Callaghan; Michael Callaghan; Thomas Callaghan; Patrick Boyle; Edward Cunningham; Edmund Cunningham. Cullaville:- 1766 - James Ferguson. Carrickamone:- Carraig a moin - the rock of the turf. The "Turf" part appears doubtful. 1766 - Robert Cunningham; Andrew Cunningham; Cormuck Daly; James Makkin. James MeCreesh, Denis McCreesh, Bernard Murphy, etc., appear on the 1828 list. Ballynacarry/Cornacarry:- Beal Atha na Cora - the mouth of the ford of the weir / Cor iia Cora - the round hill of the weir. 1766 - Patrick Hall; John Gillmore; Michael Mallon; Patrick Callan. Cornahove:- Cor na h-uaimhe - the round hill of the cave or cor na h-uaighe - the round hill of the grave. 1766 - Patrick McGeaugh; Michael Bannikiti; Patrick Rodgers; Phelemy McShane; John Kelly; Edmund MeShane; James Callan; Edmund Bannikin. Lisamry:- Lis Sarnhraidh - the summer fort. 1766 - Hugh MeShane; Patrick McShane. Monaguilagh:- Moin na Gile - the heathery bog or Muineach Gile - the white shrubbery 1766 - Owen Callaghan; James Laverty; Neal Waters; Patrick Boyle; Hugh MeVeagh; Dani. MeVeagh; Charles Burn; Matthew Kelly; Owen McGee; Widow McGee; Patrick McMahon; Edmund McMahon; James Brannagan; Laurence McCave; Art McArdle. The names Salmon, Cunningham, Boyle, Watters, etc., appear on the 1828 list. Creevekeeran:- Craobh Chaorthainn - the seat of the mountain ash. 1766 - Christopher Murphy; John McEnulty; Owen Kelly; Patrick Finegan; Terence Morrise; Neale Morrise; Manus Morrise; Widow Murphy; Patrick Murphy; Hugh Hinimnagh; Patrick Murphy. Cassidys and Donnellys appear on the 1828 list. Loughross:- Loch Rois - the lake of Ross. Ross would have the same meaning as the ross in Carrickmacross, called after Fir Rois, the men of ross territory, or it could mean the lake of the wooded headland. 1766 - Art McShane; John Morisee; Peter Woods; Neal Hanratty; John Boyle; James Lennon; Bryan Garvy; James Murtagh; Bartly Clinton; Henry Lennan. A short summary such as this does not do justice to such a vital area of the parish of Upper Creggan as Cullaville which, down the years, did not get the publicity which it deserved. Hopefully, this summary will encourage or, better still, incite, some budding local historian to undertake this onerous but worthwhile enterprise. The effect of the disasterous Famine (1845 - 1847) on the area is a case in point. When one examines the Tithe Applotment Book of 1828 with Griffith's Valuation of 1865, you discover that there were in fact more households in the area in 1865 than there were in 1828, despite the local disturbing Famine traditions. Possibly this aspect of the history of Cullaville would provide material for a future article.